This video is available for broadcast-quality download and re-use. Closed caption video also is available. For more information, contact Nathan Hurst: hurstn@missouri.edu. COLUMBIA, Mo. – Whole genome sequencing (WGS), which is the process of determining an organism’s complete DNA sequence, can be used to identify DNA anomalies that cause disease. Identifying disease-causing DNA abnormalities allows clinicians to better predict an effective course of treatment for the patient. Now, in a series of recent studies, scientists at the University of Missouri are using whole genome sequencing through the 99 Lives Cat Genome Sequencing Consortium to identify genetic variants that cause rare diseases, such as progressive retinal atrophy and Niemann-Pick type 1, a fatal disorder in domestic cats. Findings from the study could help feline preservationists implement breeding strategies in captivity for rare and endangered species such as the African black-footed cat. Rare Feline Genetic Disorders Identified Through Whole Genome Sequencing at MU from MU News Bureau on Vimeo. The 99 Lives project was established at Mizzou by Leslie Lyons, the Gilbreath-McLorn Endowed Professor of Comparative Medicine in the College of Veterinary Medicine, to improve health care for cats through research. The database has genetically sequenced more than 50 felines and includes DNA from cats with and without known genetic health problems. The goal of the database is to identify DNA that causes genetic disorders and have a better understanding of how to treat diseases. In the first study, Lyons and her team used the 99 Lives consortium to identify a genetic mutation that causes blindness in the African black-footed cat, an endangered species often found in U.S. zoos. The team sequenced three cats ― two unaffected parents and an affected offspring ― to determine if the mutation was inherited or spontaneous. The genetic mutation identified was located the IQCB1 gene and is associated with progressive retinal atrophy, an inherited degenerative retinal disorder that leads to blindness. The affected cat had two copies of the genetic mutation, indicating that it was an inherited disorder. In another study representing the first time precision medicine has been applied to feline health, Lyons and her team used whole genome sequencing and the 99 Lives consortium to identify a lysosomal disorder in a 36-week-old silver tabby kitten that was referred to the MU Veterinary Health Center. The kitten was found to have two copies of a mutation in the NPC1 gene, which causes Niemman-Pick type 1, a fatal disorder. The NCP1 gene identified is not a known variant in humans; it is a rare mutation to the feline population. Identification of both the IQCB1 gene in the African black-footed cat and the NCP1 in the silver tabby will help to diagnose other cats and allow them to receive appropriate treatment. Using results of the black-footed cat study, zookeepers will be implementing species survival plans to help manage the cats in captivity in North America. The study, “Early-Onset Progressive Retina Atrophy Associated with an IQCB1 Variant in the African Black-Footed Cates (Felis nigripes),” recently was published in Scientific Reports. 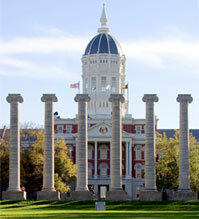 Funding was provided by the University of Missouri, College of Veterinary Medicine Clinician Scientific Grant. The study, “Precision Medicine in Cats: Novel Niemann-Pick Type C1 Diagnosed by Whole-Genome sequencing,” recently was published in the Journal of Veterinary Internal Medicine.